They Can Break Marciano’s 49-0 Record But Can They Stay Unbeaten? In boxing there are several records that stood out for years. One was Joe “The Brown Bomber” Louis with his 25 title defenses. You may not have read about it but this writer has written how Argentina’s Omar Narvaez and Mexico’s Julio Cesar Chavez had 27 defenses. Then there is Germany’s female WIBF World Flyweight and Super Flyweight champion Regina Halmich, 54-1-1, with 45 defenses but defending against people with 4 losing records and 7 making their debuts are included. Boxers have come close for years going after Rocky Marciano’s 49-0 (43) record when not only did he retire with it but stayed retired. He made an attempt after Ingemar Johansson knocked out Floyd Patterson to come back and bring the heavyweight title back to the US but found he just didn’t have what he had when he retired stopping his attempted comeback. Larry “Easton Assassin” Holmes got to 48-0 when the first light heavyweight champion in history defeated a heavyweight champion when 1976 Olympic Gold Medalist Michael Spinks put the “Spinx Jinx” on him defeating him by a narrow victory. The rematch should have gone to Holmes but same for the win’s Holmes had over “Terrible” Tim Witherspoon and Carl “The Truth” Williams being disputed. Denmark’s Brian “Super Brian” Nielsen got to 49-0 before losing to Dicky Ryan of the US. WBC, WBO and WBA Minimumweight and IBF Light Flyweight champion Mexico’s Ricardo “Finito” Lopez ended his career 51-0-1. He was 47-0 when he drew with Rosendo “El Bufalo” Alvarez of Nicaragua then defeated him by split decision. He went onto win three more fights but the draw takes away a “perfect record”. Paul “The Pittsburgh Kid” Spadafora was 37-0 and the IBF Lightweight champion when he fought to a draw with then unbeaten Romania’s Leonard Dorin, out of Canada the WBA World Lightweight champion. Spadafora lost in his next to last fight to Johan Perez to end up at 49-1-1. Indonesia’s WBA Super World Featherweight champion Chris “The Dragon” John was 48-0-3 when he lost his final bout to Simpiwe Vetyeka of South Africa ending his career at 48-1-3. Spadafora and John lost for the first time one week apart. 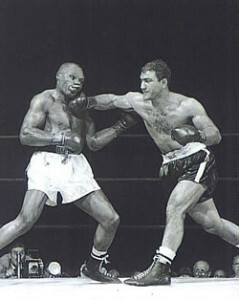 There have been five boxers who have passed Marciano’s 49-0 record while three of them went onto lose. One was Nino LaRocca, who was born in Mauratania and moved to Italy. He was 56-0 when he lost to Gilles Elbilia from France. He ended at 74-6. Mexico’s Julio Cesar “J.C.” Chavez was 87-0 when he drew with Pernell “Sweet Pea” Whitaker of the US. He was 89-0-1 when he lost to Frankie “The Surgeon” Randall of the US. He ended at 107-6-2. Featherweight world champion Willie “Wil o’ the Wisp” Pep, was 62-0 when he lost to Sammy Angott. He ended at 229-11-1. Then there is Floyd “Money” Mayweather, Jr. who retired at 49-0. Then twenty-three months later comes back to defeat an amateur with a 0-0 record in MMA champion Conor McGregor. Why that was ever considered anything more than an exhibition shows you how in boxing things can be “arranged” which is what the Nevada commission did. Few people that this writer knows realizes that Thailand’s WBC World Minimumweight champion Chayaphon Moonsri aka Wanheng Menayothin is currently at 50-0 and scheduled to fight August 28th against No. 14 ranked Pedro “Rattle Snake” Taduran, 12-1 of the Philippines in Thailand. All of Moonsri’s fights have been in Thailand. It will be his tenth defense. You can rest assure with a victory Mayweather will come back again. In gest this write said “the rematch between Mayweather and and McGregor will be on St. Patrick’s Day in Dublin, Ireland. Mayweather wanted no parts of Paul “The Punisher” Williams or Spadafora. The latter worked him over in the gym per his then trainer Jesse Reid.